I think this is the biggest box I've tried to make, it's for a Torah that was recently on exhibit and needs to go back to RBMSCL. I'm experimenting with using double-walled corrugated board rather than binders board since it has strength but not weight. The board surface is easily marred but with the book cloth adhered it seems pretty solid. I'm going with a telescoping design, that is a smaller tray that has a separate slightly larger lid that fits over it. What I'm not sure of yet is the design of the lid. The base is too big to make a lid from one piece of board, so I will have to cobble something together. I'm also considering experimenting with a polyester lid so you can see into the box. Nothing will be stored on top of this box, so having a sturdy lid may not be an issue, but would it provide enough protection? More thought is needed. Luckily the next few days are chock full of meetings, so I'll have time to mull it over. Today, Thanksgiving Day 2010, Preservation Underground turns one year old. It's been quite a year, the department turned 10 years old and we celebrated with an exhibit and interviews with the staff (search "Tenth Anniversary Celebrations" and "Ten Years, Ten People" on our blog to find those). We've shared some fun projects like Boxing the Devil, scanning the Ehiopic scrolls, summer workshop adventures, and stuff we've found in books. In this season of giving thanks, we thank you for reading and commenting on our blog. I like to think there are many more readers out there than we realize. Thanks to everyone in the department for their hard work and dedication, and for making every day an adventure. Thank you to Amy and the Devil's Tale for helping us get started a year ago, and for naming the blog. And a big thanks to our fellow bloggers for starting up a wonderful community of like minded people (see our sidebar for some links, and check out all the library blogs we have!). This blog is one of the more fun parts of my job, I love sharing what we do with everyone in the library and out there in the real world. Happy Birthday to us! To help us celebrate, leave us a note on your favorite post, or tell us what sorts of things you would like to see more of, or wish us a happy birthday . We also like chocolate chip cookies. Image: Ethiopic wooden cross illustration from the Rare Book, Manuscript and Special Collections Library. It's an urge, an itch you can't scratch. You see a broken book and you instinctively reach for the tape. You want to fix it, make it whole. We know how you feel, we feel the same way. But tape is not the way forward my friends...not for your valuable materials, the ones you want to pass down someday to your kids. We see a lot of DIY book repairs. I think the people who try to fix our broken books at home are trying to do what they feel is right. 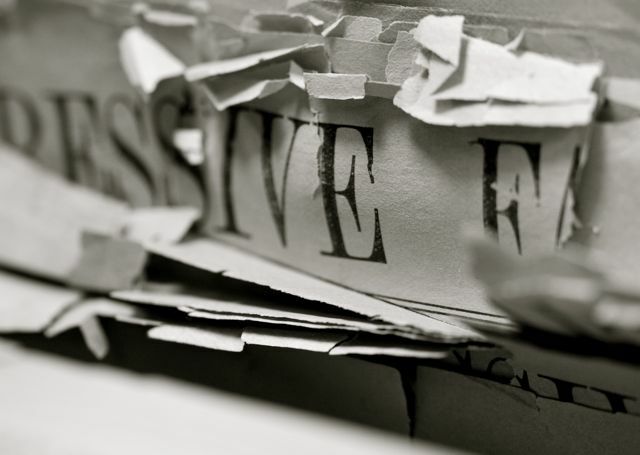 The problem is that self adhesive tapes are too strong for brittle paper, it pulls pages out of bindings and often takes several pages at a time. Tape is very difficult or impossible to remove completely unless you use solvents, and it often can't be removed without damaging the paper surface. If you have something valuable and it is in need of repair don't reach for the tape, reach out to a conservator. You can find one through the American Institute for Conservation. On their site they have information on finding and selecting a conservator as well as tips for preserving your treasures. By the way, the image above shows an older DIY repair done with masking tape. I took a picture because the person carefully colored the tape so it would be less noticeable. I'm not sure it completely worked, but I give him/her credit for trying to make it a less obvious repair. Remember Letraset? it was a staple for me as a young art student back in the day. I found this in a book that came to the lab today. Smurfs and Letraset, totally old skool. The book itself is a mess of problems. 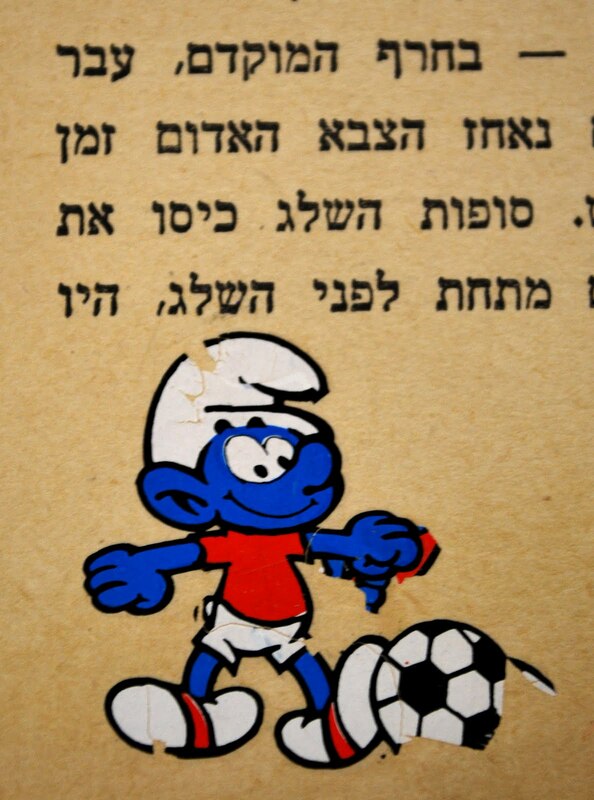 Besides Soccer Smurf here, the paper is very brittle, the binding is hanging on by a thread, and someone tried a DIY book repair (or three) with brown packing tape to keep pages together. Needless to say this is also on hold for a patron. Have you ever been in the front of class or demonstrating something and thought to yourself "am I getting through to them?" A couple of weeks ago we held our annual week-long care and handling training to show staff and student assistants what sort of material to send to conservation. We got two proofs of life through campus mail this week...pieces of broken books disembodied from their texts. This one was a piece of an old acidic pamphlet binder that broke off, the other was a detached spine. It's nice to know that our pleas for broken books sank in. Thanks for listening and participating! And please send the actual items, too. Your humble author rounds out the last of the Ten Years, Ten People series. I am the Head of Conservation Services and have been at Duke for eight years. I work with some amazing people and some equally amazing collections. The best part of my job right now is bringing you into the Underground to show you, dear reader, what it is that we do below decks. I hope you have found our sites informative and fun to visit. In this video I share a personal story of unexpectedly finding an image of one of my ancestors in our collections in the Rare Book, Manuscript, and Special Collection Library. We just finished our fall semester Care and Handling sessions wherein we give out tips on safely handling library materials. We also display our "show of horrors" which covers amongst other things torn pages, food spills, damaged spines, and of course brittle paper. These sessions are valuable to us because we get to talk to the staff and students who are our partners in keeping our materials in good condition and ready for the next reader. A great many items that come to the lab do so because they have circulated. If damaged, an alert staff member recognizes that it should go to Conservation and sets it aside for us. We could not be successful in our efforts to keep materials circulating without their help. We also hold these sessions to get feedback on our services and how we can help create effective and efficient workflows. Over the years we have heard some comments about how much boxing we do and the perception that we prefer to box things rather than fix them. This is why we put brittle materials into our show of horrors. At some point, paper becomes too brittle to do anything for it. It cannot be sewn or glued, sometimes it can barely even be handled without self destructing. We make every effort to repair the books and manuscripts in our care but sometimes we simply don't have any durable repair options due to their fragility. This is why we make thousands of protective enclosures every year, a good portion of these are for brittle items. Protective enclosures keep pieces together while we make reformatting or replacement decisions, it protects the already fragile book from further damage while checked out or while on the shelf, and it alerts people to handle these books just a little more gently. A box can sometimes be a hindrance to use. But it is our job to balance the needs of the reader with the needs and preservation of the object. This balancing act is not always an easy thing to do, but hopefully our patrons understand that it is a far better thing to have access to a brittle book than having no access to that book at all. "Mastering Craft: Interpreting Historic Bookbindings"
On display outside of the Preservation Department, Perkins Library, Lower Level 1, Room 023. Open during regular library hours.